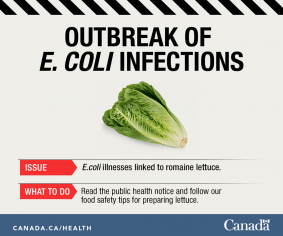 As of May 9, 2018, there are six Canadian cases of E. coli O157 that are genetically similar to the U.S. outbreak linked to romaine lettuce coming from the Yuma growing region in the U.S. The six Canadian illnesses are reported in four provinces: British Columbia (1), Alberta (1), Saskatchewan (2), and Ontario (2). Individuals became sick between late March and mid-April 2018. One of the Canadian cases was hospitalized, and no deaths have been reported in Canada. Individuals who became ill were between 13 and 68 years of age. The majority of cases (67%) were female.In the Canadian investigation, among the six cases, most of the individuals who became sick reported having eaten romaine lettuce at home, or in prepared salads purchased at grocery stores, restaurants and fast food chains, before their illnesses occurred. Two Canadians did report traveling to the U.S. before getting sick and eating romaine lettuce while they were there. This entry was posted in E.coli, E.coli O157, E.coli O157:H7, food bourne outbreak, food death, Food Hygiene, Food Illness, Food Inspections, Food Microbiology, Food Microbiology Blog, Food Poisoning, food recall, Food Safety, Food Safety Alert, Food Toxin, Food Virus, Uncategorized. Bookmark the permalink.